Couples Fitness Training at Hitch Fit Gym! Home/Success Stories/Couples Fitness Training at Hitch Fit Gym! Kansas City Friends Get in Shape Together at Hitch Fit Personal Training Gym! 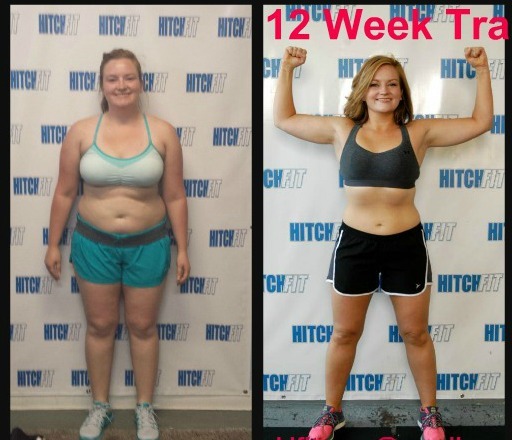 “I cannot begin to explain how life changing this Hitch Fit transformation has been. The results that you see in these photos are from a lot of planning, hard work, determination, and sweat. I am so proud to have done my weight loss journey this way. It has proven to me my character: I am hard working and determined, and I know now more than ever that whatever I focus my mind on can be conquered. This transformation took a lot of mental toughness, from staying away from foods that would derail my success, to making myself wake up in between twelve-hour shifts to work out for an hour and half to two hours. Before this Hitch Fit program I would have told any one that I did not have any self control when it came to food. I would not be able to resist that donut on the table in the break room. This program has helped me look at food in a completely different way. I now have self control and know what I am capable of. That in itself has changed me mentally more than physically. In previous weight loss endeavors I had always been a cardio snob. I never understood the impact that lifting weights could have on my weight loss and fitness goals. I always had a preconceived notion that if I lifted weights, I would become “manly” buff and not feminine looking. I have always liked being curvy and had embraced being a thicker woman. For the past several years I had stayed about the same weight, around 160-165 lbs. My weight had slowly crept up and all of the sudden I was 177-179. I was in denial about how I got to that point. I had reached a point where I was not comfortable in my own skin, in my own clothes, and even in my scrub uniforms as a nurse. I had hit my breaking point, and I knew I had to do something. I have a co-worker who had just finished her 12-week hitch fit transformation. I was talking with her about the process and kept thinking about it non-stop. Something was pulling me to get more information. I kept looking at the website and reading all of the transformation stories. I was looking through Groupon one night and I saw one for Hitch Fit for $20 for 2 sessions. I texted my best friend, Emily, and asked her if I bought her one for her birthday if she would be interested in trying it with me. She said sure, so I contacted Mica for the both of us to set our first session up. I honestly did not think that it would be any more than just doing the 2 sessions and getting some more information on incorporating lifting weights into my cardio routine. I did not know anything about weight lifting and was very nervous prior to the first session with Mica. Emily and I went to our first session and after learning about the options for transformations, it was inspiring to see all of the transformation pictures on the wall of what others had accomplished and how they had changed their bodies in such a short time frame. Mica was so welcoming, knowledgeable and encouraging. The session was so much fun, and when we left Emily and I looked at each other and started talking immediately about how we could make this happen. Right then we made the commitment to do Hitch Fit for a 12-week transformation. That was honestly one of the best decisions I have ever made. I did not realize initially how important the nutrition was going to in the transformation process. It was a little stressful at first because it was a big change. Working night shift for twelve to thirteen hour shifts, I did not know how I could possibly eat 5-6 meals a day. It took a lot of planning and preparation, and people thought I was crazy because I was supposed to be losing weight but was eating more than ever. I trusted in the process and soon people started seeing results and stopped thinking I was so crazy! One thing that I am most proud of nutritionally is that before this process it would be a weekly occurrence (at least) that I stop by a fast food restaurant in the morning after work. Now, that is not even an option at all. I have learned that I can still eat the foods that I love in moderation but the base of food knowledge that you gain in this process is overwhelming. My focus is on what is the best fuel for my body, and then making it taste good for me, not what is the fastest, easiest thing to eat. I always focused on just calories in the theory that you need to burn more calories than you take in. This process has also taught me a lot about how monitoring sugar, carbs, fats, and carbohydrates affects your health and fitness goals as well. If you embrace the nutritional aspect of this change, you will gain so much knowledge from Mica, and those changes are going to be part of my diet for the rest of my life. Call 816-753-8900 for information on training at one of our two private personal training studios.